He informed that IGMC with the recorded highest number of patients in its history with touching the figure of 4091 registration which is the record of daily footfall for treatment on Mar 25 hospital. Shimla: Premier Indra Gandhi Medical College Hospital (IGMC) recorded the highest footfall of patients in any working days of its history as the IGMC hospital daily dairy records about 4091 patients, a senior functionary of hospital informed in a report issued about the development here on Tuesday. 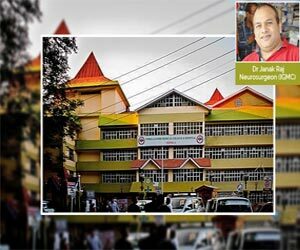 Senior Medical Superintendent Dr Janak Raj told UNI that IGMC is offering the best, affordable and cost-effective health services achieved major milestones as it treated the highest number of the case in any working day. The Indira Gandhi Medical College (IGMC Shimla) is a state-owned medical college and hospital in Himachal Pradesh. It is affiliated to Himachal Pradesh University, Shimla. Himachal Pradesh Medical College was renamed Indira Gandhi Medical College (now popularly known as IGMC in abbreviated form) in 1984. Admission facility was increased to 65 in the year 1978. Now MBBS seats have been increased to 100. The post Graduate courses were started in 16 disciplines in the year 1981. The college is having 33 departments equipped with latest machinery and equipment. Several of its alumni are the faculty members in well known Medical Colleges in India and abroad. Multi-storied buildings at Snowdon, Kamla Nehru hospital together contribute 872 beds to IGMC. The Department of Radiotherapy & Oncology of this institution is an approved Regional Cancer Centre (RCC) of India. The institute facilitates sophisticated equipment like MRI Scan, C.T. Scan, Cobalt Units, Gamma Camera, Selectron, Upper G.I. Endoscope, Colonoscope, Bronchoscopy, Nuclear Medicine facilities, ERCP, Ultrasonography, Haemodialysis, Pulmonary function test including diffusion studies and blood gas analyzer, Intensive Care Unit, Pacemaker, Holter Monitor, Colour Doppler Echo-cardiography, image intensifier for orthopedics and Cardiology. Treadmill test, E.C.G., Laparoscopic surgery, transurethral resectoscope, laser and microwave diathermy for physiotherapy are in operation. SOUNDS GOOD. IT\’S BETTER FOR THE PEOPLE OF H P . OTHERWISE THEY WOULD HAVE WASTED LOT OF TIME , MONEY IN VISITING PLACES LIKE CHANDIGARH, DELHI. GOOD WORK HIMACHAL GOVERNMENT. I WISH SAME OR BETTER SERVICES TO BE FOR THE PEOPLE OF BIHAR ( VIHAR – ORIGINAL NAME). UTTER PRADESH , M P, ,HARYANA. , RAJASTHAN….. LET THE AIM OF NEWER AIIMS TO WORK LIKE AIIMS NEW DELHI. WITH THE INTRODUCTION OF INSURANCE SCHEMES , THOSE HOSPITALS SHOULD BE ABLE TO GENIRATE ENOUGH MONEY RUN THE HOSPITALS ON THEIR OWN.